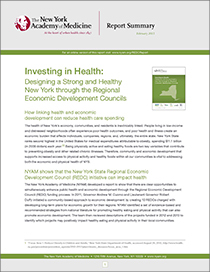 As New York State engages in strategic plans to boost the economy, there are multiple opportunities to also address the consideration of health in those plans. Improving the health of communities can also improve the economic vitality. This topic identifies opportunities to engage non-traditional partners in the benefits of good health to economic development initiatives. 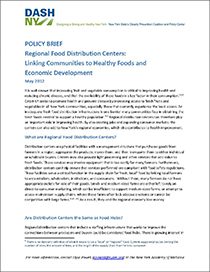 The Regional Food Distribution Centers: Linking Communities to Healthy Foods and Economic Development policy brief, produced by DASH-NY, discusses the role that regional distribution centers can play in improving the health of communities. Regional distribution centers present the opportunity to improve access to healthier food, and can also contribute to economic development through job opportunities and expanding consumer markets. The Regional Economic Development Councils (REDCs) were created by Governor Cuomo to engage multiple sectors in the economic development plans for NYS. The Councils utilize a community-based, bottom up approach to creating strategic plans for economic development and applying for funding opportunities with state agencies. 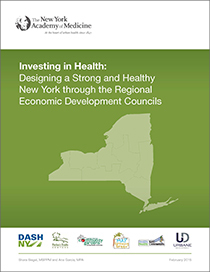 The New York Academy of Medicine produced Health and Economic Development: A Resource for the New York Regional Economic Development Council Meetings for working with the Councils. 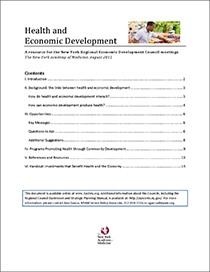 The New York Academy of Medicine (NYAM), with support from the Designing a Strong and Healthy New York (DASH-NY) Economic and Community Development Workgroup, identified opportunities for New York State’s REDCs to impact the health of New Yorkers, as outlined in the report, Investing in Health: Designing a Strong and Healthy New York through the Regional Economic Development Councils. Increased funding of initiatives that create access to healthy food and physical activity can prevent chronic diseases and lower health care costs. A summary of the Investing in Health report is also available, here. The number of REDCs that improve health in economically disadvantaged communities increased from 45 in 2012, to 127 in 2013, and 130 in 2014. However, this dropped off the DASH-NY priorities in 2015. We estimate that 93 REDC projects in 2015 and 115 REDC projects in 2016 received funding and support for health improvement in economically disadvantaged communities. In 2016, DASH-NY engaged the Deputy Secretary of Health on this issue, and we hope to see progress in 2017. Capital District Community Gardens (CDCG) won a Regional Economic Development Council Award in 2013 for its Urban Grow Center, a multiphase project that will enable CDCG to increase its distribution of locally grown foods to inner city neighborhoods. The award will enable CDCG to increase its distribution of locally grown foods to inner city neighborhoods, innovate green technologies, and enhance economic development through job training programs to adults as well as under privileged youth. DASH-NY facilitated a 2-part webinar series on REDC awards. Part 1 of this webinar series, The Designing a Strong and Healthy NY through the REDCs: A Case Study of Capital District Community Gardens, shows how these awards can link health and economic development. Part 2 of this webinar series, entitled REDCs: How they work and How to Get Involved! explains what Regional Economic Development Councils are, how to get involved in the REDC process in your region, and how to apply for the next round of funding. 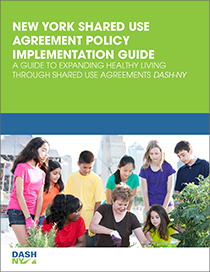 The DASH-NY PDF presentation, Using Shared Use to Improve the Food Evironment, was launched on Food Day in 2015 and in conjuction with the launch of the New York Shared Use Agreemenment Policy Implemenation Guide. Shared use can be used to change the ways we eat by impacting food systems and environments. Food Day is an annual event with food activists around the country participating and hosting lectures, festivals, school activities and more to promote healthy food environments. 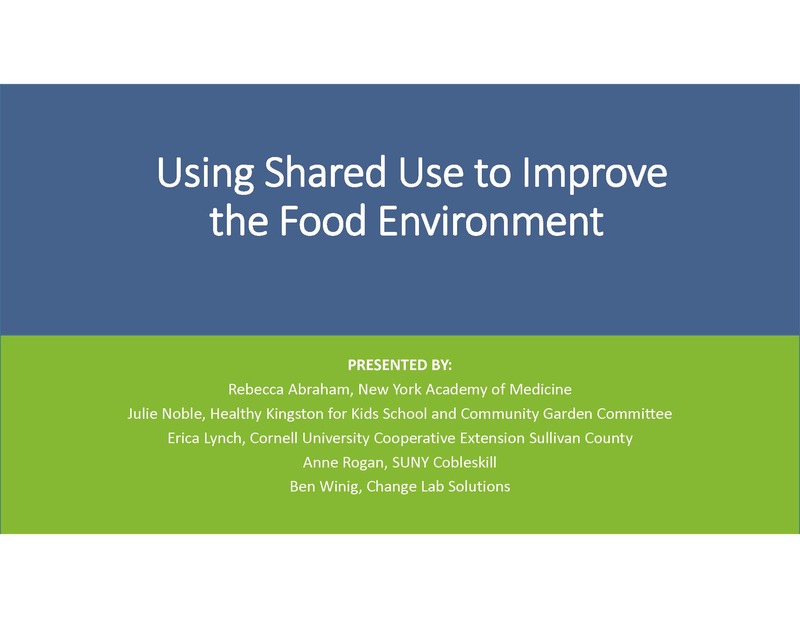 The PDF presentation illustrates three case studies on how shared-use can be used to impact food systems, and provides an overview of the online resources included in the toolkit. The New York Shared Use Agreemenment Policy Implemenation Guide is an informational resource for community members, local stakeholders such as parks and school officials, parents, teachers, and public health advocates interested in improving opportunities for healthy living by implementing shared use agreements across New York State. Multiple studies have shown that offering people access to recreational spaces and opportunities to buy fresh fruits and vegetables is important for fighting chronic disease, but in low-income areas and densely-built urban environments, such opportunities are not always easy to find. One strategy for ensuring broader access to existing physical spaces is the concept of joint use, defined as the sharing of a single space by two separate entities. A joint use agreement can, for example, facilitate community access to an otherwise locked schoolyard by allowing the school to share with another public or private agency the costs and risks associated with opening the property after-hours. Typically, each party under a joint use agreement helps fund the operation and maintenance of the facilities that will be shared. Nationally, facilitating community access to school recreation areas is one of the most common applications of joint use. In New York City, however, many schools lack their own recreation space. This context therefore presents two alternative implementations of the joint use concept. First, joint use can be used to enable schools to access a public or private recreation space that might be available, such as a city-funded park or senior center, or a YMCA gymnasium. Secondly, joint use can be used to obtain access to the grounds of an alternative City institution prevalent in low-income areas, the recreational spaces and community centers maintained by the New York City Housing Authority (NYCHA). 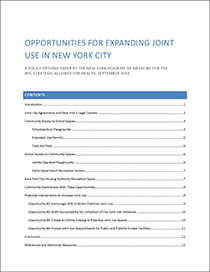 Opportunities for Expanding Joint Use in New York City-2010 discusses both scenarios, as well as the more traditionally understood joint use. We provide an overview of some of the current avenues for implementing joint use in New York City and identify opportunities for expanding these opportunities. Using Planning and Zoning in New York State to Promote Healthy Living is the first in a two-part webinar series on planning and zoning on the local level. Part 1 focuses on comprehensive planning and planning and zoning laws and practices with a special focus on how to improve health in the state of New York. The webinar discusses the best opportunities for change on the local level, which channels must be tapped to make change, and will help participants identify who in their community should be brought into the process. The slides used in the webinar Using Planning and Zoning in New York State to Promote Healthy Living are also available as a PDF file. Part 2 of the DASH-NY webinar series on planning and zoning for health, Land Use in Economic Development Strategies, looks at the multiple synergies that can be accomplished through local planning and zoning strategies. Experts share evidence connecting planning and zoning efforts to improve health and economic outcomes, and successful efforts in other communities and will discuss national best practices. Additional information addressing webinar participant questions and answers can be found, here. Educating Decision Makers: Local Strategies to Sustain Prevention Projects in Public Health webinar was conducted in February 2012 and explained how to cultivate relationships with policymakers to sustain support for local prevention programs and the federal policy context for such programs. Webinar presenters shared strategies for educating elected officials that are appropriate and legal for non-profits and provide guidelines and key definitions for non-profits around lobbying and advocacy. 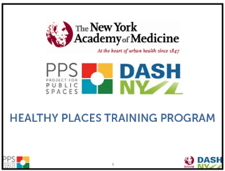 As a part of DASH-NY, Project for Public Spaces worked with the Academy to deliver the New York State Healthy Places Training Program in six locations around New York: Syracuse, Batavia, Saranac Lake, Farmingdale, Albany, and Brooklyn. The Healthy Places Training Program presents a holistic approach to improving health by planning active transportation systems that connect to key destinations, including healthy food hubs that eliminate food deserts and support local business. The training program was aimed at local, regional, and state public health officials, along with other key stakeholders, to foster understanding and implementation of policies and programs that simultaneously encourage physical activity and healthy eating—while also revitalizing the streets, parks, and gathering spaces within their communities. The following set of Public Markets Resource documents cover NYS programming resources, support organizations, and funding sources. While there is currently no active policy agenda, the DASH-NY website exists as an archive of resources for members of the greater community to learn about policy initiatives that address chronic diseases in New York State.